The FDA: Is the Safety Watchdog Getting Tougher? Most parents have already cleared their children's toy boxes of playthings containing lead-laden plastics or paint. But according to a new study published on Monday in Pediatrics, the toxic heavy metal may continue to lurk in other, less expected sources in the home  like in the kitchen pantry. After several reports of lead poisoning in Indian children in the Boston area were linked to consumption of Indian spices, researchers at Children's Hospital Boston and the Harvard School of Public Health decided to measure the amount of lead in the seasonings as well as in ceremonial powders commonly used to mark newborn Indian infants for religious and cultural purposes. With repeated exposure at high enough levels, lead can cause cognitive damage and behavioral changes in children. In most cases, lead poisoning can be treated by reducing the child's exposure and by making sure he or she eats a balanced diet with sufficient iron, calcium and vitamin C  deficiencies in these can increase the body's absorption of lead. In extreme cases of extended lead exposure, doctors use drugs called chelating agents, which bind to the lead and pull it out of the body through urine. In severe cases of prolonged poisoning, however, the cognitive and developmental damage may be permanent, says Dr. Cristiane Lin, the study's lead author, who is now at Seton Medical Center in Austin, Texas. Studies have shown that a blood level of 10 mcg of lead per deciliter of blood is associated with potentially irreversible harm, although recent studies have shown that as little as 5 mcg/dL can also be dangerous. By extrapolating from their data, researchers estimated that if a population of children under age 4 was routinely exposed to Indian spices or ceremonial powders, the additional ingestion of lead would lead to a threefold increase  from 0.8% to 2.8%  in the percentage of children with a blood level of lead over 10 mcg/dL. "Our message is to say, Be aware of these products that may contain lead," says Lin. "From a pediatrician's perspective, it's good to push for screening of nonpaint sources of lead." Although the majority of lead-poisoning cases in the U.S., about two-thirds, occur when young children lick or ingest lead-containing paint as it peels or chips off walls, the new study reminds doctors and parents that they need to be aware of less obvious sources. Imported products such as the ones studied by the Boston group are a particular problem, since environmental standards around the world are not the same as they are in the U.S. In countries like India, for example, leaded gasoline is still commonly used in cars (in the U.S. it was replaced by unleaded fuel in the 1970s), and the lead from car exhaust can seep into the ground, saturating the soil in which food plants, including those that are dried and ground into spices, are grown. Such environmental exposure is the most likely source of lead in the products they tested, say the authors. 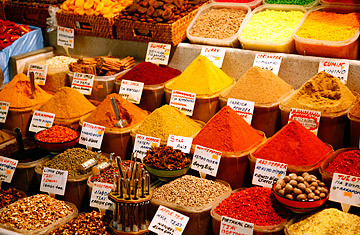 Currently the Food and Drug Administration, which oversees the safety of food products imported into the U.S., does not have specific guidelines for screening lead in dried products like spices. That's because the FDA feels there is no safe level of lead in dried products, since studies have not yet established that lead exposure doesn't lead to adverse health effects. The agency has different thresholds for acceptable lead levels depending on the product and how it is to be used, says FDA spokesperson Ira Allen. For example, in 2006 the agency lowered its acceptable level of lead in candy, which children are likely to eat in large amounts. The FDA also reaffirmed its position that paints used in candy labels should be entirely lead-free, or they would be in violation of the Federal Food, Drug and Cosmetic Act. "We look at imports and we look for lead and other elements," says Allen. "But we do it on a targeted basis, and some of that basis is how the product is intended to be used." Since last spring, the agency has been reviewing its protocols for spices, to determine whether the risk of contamination or exposure to elements such as lead from dried products imported from overseas warrants more scrutiny. "We have extensive surveying of imported foods at major ports," says Allen. "Obviously we can't look at everything, but we do target inspection based on where the food comes from and what the history of the product is, and we do ban certain products." The levels of lead found in Indian spices and powders in the current study may not set off the FDA's alarms, but, as Lin and her team note, it should alert pediatricians to diagnosing lead poisoning and getting exposed youngsters into treatment sooner.